◆ There are up-linked and down-linked design for the Dental unit, the main box and instrument plate adopt the advanced injection molding process, and anti-corrosion, ant-rust, fadeless. The instrument plate is equipped with transparent silicone antifouling disk protection mat, with 135 degrees high temperature sterilization disinfection, avoiding cross infection. ◆ New instrument arm with two sets ball beating ensures turn smooth, accurate position, hidden joint design, equipped with locking devices. ◆ The Automatic depressurization and pressurization purify water system, and satisfy the need water and pipeline disinfection, and is equipped with water alarm prompt device. ◆ New Embedded connection box design for Dental chair , power system adopt Denmark LINAK liner mute motor, the movements are safe and smooth, and chair in the range of 410mm to 750mm, load is more than 135kg. 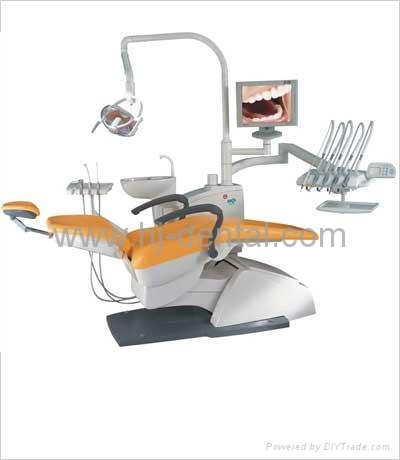 ◆ Graceful techniques, fashionable figuration and specification make the dental unit integrated into the global market. ◆ S2318 has been awarded ISO09001 certification and CE certification. ◆ Double deck instrument tray provide more spare freedom. ◆ Integrated holder for curing light and scaler. ◆ New integral ceramic spittoon and 90 degree rotated main chest and hand holder for convenient operation. ◆ Adopt import solenoid valve to control flushing and rising water time, and automatic heating for rising water.